April 15th-21st is National Volunteer Week, and here at Thrive, we’re celebrating by preparing walls for murals and getting supplies ready for volunteers like you! 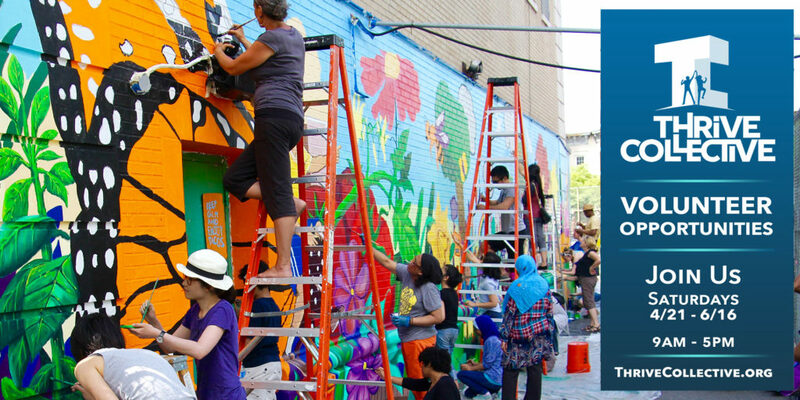 Our mural program beautifies local communities while empowering students through teamwork, ownership, creativity, and the experience of bringing their ideas from inception to execution. There are opportunities for people of all artistic levels to get involved, so come spend a Saturday with us and see what we’re all about! Our Spring Mural Sessions run each Saturday from April 21st through June 23rd. Beginning this week, you can participate at one of three locations: Bay Ridge, Brooklyn; Arverne, Queens; or Kingsbridge, Bronx. Additional sites will be added in the weeks to come. We know how valuable your time is, so we promise to match all volunteers with opportunities where they can truly add value – no busy work! Our events go from 9-5, and we encourage you to sign up for the hours that work best for you. Plus, childcare will be provided for children age 5 and younger, so the entire family can participate! Check out our volunteer page for more information on how to get involved and to register. Generous donations from the community allow our teaching artists and mentors to continue to make a difference in our community. Plus, we guarantee that 100% of donated funds and materials will go to art education and mentoring at an NYC public school! There are a number of creative ways that you can rally support for our organization on a larger scale. Think about registering your event on a non-profit platform to keep track of attendees and manage donations. Local businesses may also be interested in donating supplies or collection space for your drive! Open to undergraduate and graduate students in good standing, our internship program provides an excellent way for students to give back while learning valuable career skills. We’re looking for those who are flexible, work well both independently and as part of a team, and are passionate about inspiring social change by empowering young people and their communities. With four different focus areas, this program might be a great fit for someone who wants to make an impact while gaining professional experience! If you’re excited about Thrive’s mission or the volunteer work you’re doing with us, let your friends know! Share photos of the mural you helped with on social media with the hashtags #BringArtBack. #iVolunteer and #ThriveCollective. Inform your friends, family, and local community about the impact their donation could have. We rely on our network to be our best advocates, and hope to continue to expand our impact on the community by inspiring new volunteers to participate. Volunteers add unmeasurable value to our programs, and they often remark on the personal growth and satisfaction they reap from their time at Thrive. However, for National Volunteer Week, we want to thank them for the huge impact they have on our programs and the greater community. To all past and current volunteers, fundraisers, interns, and advocates – THANK YOU! We could not do our great work without your selfless donations of your talent, your time, and your voice. And to all future volunteers – we can’t wait to meet you!